The last time I went gaga over a television series was way back in the 90’s, mostly American tv programmes such as Seinfeld and X-Files. Since these shows folded up (at least my love affair was only up to Season 5 of the X-Files cause after that I lost interest) I have never really loved any other tv show with such a passion, FRIENDS came close but not quite. Then I moved to the UK, and without wanting to bore you with the more intimate details, I fell in love with Doctor Who since seeing the last X’mas special, The Voyage of the Damned last year, and the rest if I may say so, is travelling back in time, ehr history. 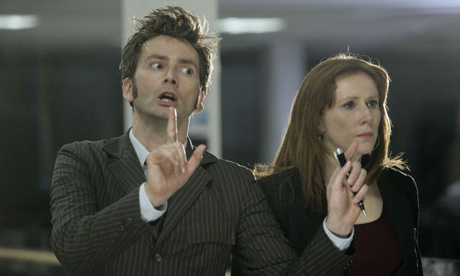 Plot: The Doctor (David Tennant) and Donna (Catherine Tate) independent of each other infiltrate, by not so cunning and near identical means, a company called Adipose Industries. The company has successfully marketed a slimming pill to over a million Londoners and both suspect that there is more to it than meets the eye. Donna is investigating as she (rightly) believes that by seeking out unusual trouble she will attract the Doctor’s attention. She has regretted not taking up his offer of a few lifts in the Tardis and aims to put this right if she can. Oh one more thing, The Adiposeans are so cute!!! And Sarah Lancashire was lush. Welcome back Doctor, and to your new companion Donna. You are worth the wait. If you live in the UK, you can still catch the episode at the BBC iPlayer for up to 7 days. This is it! The wait is over! The TARDIS will finally land and out comes the Doctor with a new companion, Donna Noble, played this time around by Catherine Tate. 3 DVD Boxsets later and come Saturday will be the start of the Doctor Who Season 4 on BBC One. It’s the first time I will be following the season and it’s really quite exciting. I still don’t own a telly mind, but bless the BBC for coming up with the iPlayer so I can still watch it albeit an hour after the telecast. So if you know my number don’t bother calling for I won’t answer, if you think you can do telepathy, believe me it ain’t gonna work.